My interview by "Hear It From Locals"
JOIN US IN AN INTERVIEW WITH ROWENA CARALDE FROM MANILA, PHILIPPINES ! IS IT YOUR FIRST TIME TO TRAVEL & TOUR ABROAD? I have been from a lot of tours in Asia since I was 19 years old. I finally decided to visit Bangkok on November 16 to 19, 2018 after I heard from some friends on how exciting to tour in this country. Being a solo traveler, I was afraid to go alone though I know exactly how-to DIY (Do It Yourself). Honestly, as a travel agent, if I book my tour package by myself for 4 days, I can save as much as Php 2,000 for everything. But I love the thought of belonging to a group which is composed of 8 persons and most of them are a wide traveler. But I was wrong and surprised that things became difficult (I will tell the story in a later subject). After I have confirmed my interest in joining, the travel agency who booked my trip had immediately collected the payment and said that the flight was booked and confirmed, including the tours and accommodation. What a dismayed after 2 days, he told me that I need to add another Php 2,000 because the airfare had increased. How could it be so possible if the offer was a pre-booked package? I am a travel agent and they know it. Still, they are not ashamed of what they asked for. Yet, I am so kind that I continued and paid, instead to cancel and ask for my money back. Upon confirmation of your tour, you must ask your travel agent of other fees like travel insurance (Php 350.00 average) and travel tax if it is already included in your package. The travel tax normally is Php 1,620 which must pay in the airport. Most agencies do not discuss it if you will not ask. Check your flight itinerary prior to your flight day if a seat is already assigned. 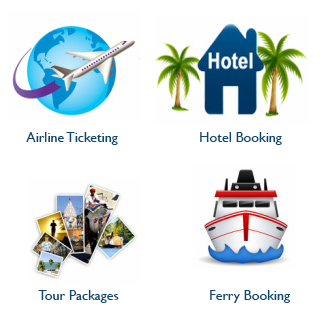 Otherwise, you may request to manage your booking online through your agent. Also, if meals are included or you prefer to order on board, and how much luggage weight is allowed for your type of booked ticket. Make sure you will not exceed over the allotted weight and you have some space for your shopped stuff when you return. Normally, for a group tour, a travel agent sends a coordinator at the airport to provide orientation and assistance to their tourists. If you are alone, at least they must call you and instruct you on how to do and provide you with an information on the procedures. Show your flight ticket/itinerary copy and passport at the main entrance guard. Make sure you are at the right terminal and the right gate, even you have already checked online. Check the status of your flight. It is always great to get to the airport for a minimum of 3 hours before your flight schedule. My flight was retimed and adjusted in advance for an hour and I didn’t receive a notification directly by the airline. At least my travel agent has forwarded to me the advisory. There are restaurants and café to stay while waiting for your check-in time if you are still so early. Normally, 2 hours before a flight the check-in counters are ready to receive you. Please note there are computers/machines as to where you can self-check-in online. However, you need still to go to the check-in counter for verification of your documents and your paid travel tax. At the immigration counter, be ready to present yourself with your filled-up departure card, flight ticket, tour itinerary, and passport (take it out from passport jacket). In entering the gate for departure, you must know that at the baggage control area the things that are not allowed to carry inside the cabin like nail cutters, swiss knives, scissors, any bladed items or sharp objects and liquids, aerosols, and gels (LAGs) in 100ml above. Funny thing, they confiscate even your bottled water but when you buy at the duty-free shops of whatever I have mentioned above, they wouldn’t know as there be no anymore checking for baggage before boarding the plane. You no need to buy currency from your country of origin. It is always better to buy their money at exchange centers upon arrival. Not all exchange centers have the same rate. In my case, I went to 3 exchange centers just 1 block away from each other. The first one has 560 baht for a thousand Philippines pesos, the 2nd one has 510 baht, and finally, the 3rd one changed it to 590 baht. Find the assigned Gate for your flight. It is always better to spend time waiting at the designated gate lobby. Assure yourself that you are at the right one. Soon as they announced that boarding is ready, do not jump up on the queue. Check first your seat number. If your seat is at the tail side of the plane, better not to mix up with many people. Either go ahead of everybody or be the last to go. Expect that there would be slow traffic upon boarding the plane for some people who get ahead of you would take time placing their baggage. Please expect if you have arranged and bought a seat from A seats, most probably you will be with people carrying a baby, challenge people (others called them to disable), pregnant, oldies, or those with special situations. So, if you think you are special, and you are capable of buying a seat in there, indeed you are ???? Go to the lavatory before you sit. Some people will line up only after they have already fixed themselves and if they are on the window side, imagine how they get too out of their seats and people next to them must stand up too. Also, you pray that your seatmates are not snoring and not clumsy. If they do, you have no power to control that but just tell yourself you are very unlucky ???? Always carry a jacket or shawl to protect yourself from cold and from your strange seatmate who sneeze most of the time without even covering his mouth. I was really annoyed that the whole time the guy next to me keeps on doing that. He also blows his nose so hard and noisy. If the cabin is not so full and you think there are vacant seats, you can request the flight steward for a transfer. If you suffer from air pressure, avoid poking your ears. Press your nose, swallow from time to time, or chew a gum; these will relieve you. Don’t be shy to remove your shoes, just make sure there will be no bad smell from it ???? Make sure you have your disembarkation card (ask the steward) fully filled up before you leave the plane. This is mandatory at the immigration counter. The half part will be surrendered upon arrival and the other half must be kept as it is needed in your return. The local tour coordinator is waiting for us at the arrival section we have the pre-arranged transfer to our hotel. The first thing she asked us to buy a local sim card from her which is double the price when you buy from a local store. Think about buying what you need for a local sim. Is it more for data, calls or SMS? Our hotel is in Pratunam; the shopping capital in Bangkok. This is closer to Suvarnabhumi International Airport (45 mins away) and quite far from Don Mueang International Airport. When we asked, why our hotel is far from Don Mueang Airport, the answer is unbelievable! The coordinator said, “because you booked a cheap airline”. I got to think that the agency has the understanding that 99% of Filipino tourists are big shoppers. So, expect that there would be more Filipinos checked-in to some hotels in this area. We are hosted in a very busy street for pan Asian food and many kinds of stuff all along the roadside. I enjoy this kind of frantic city living environment for as long as it is safe from pick-pocketers or snatchers. Buying foodstuff from everywhere, you must be conscious in asking how much for those have no tag price on display. Some vendors will collect double the regular price after they handed to you your order. You cannot complain as you never asked first, and you assumed their price is the same with others. We had our dinner nearby our hotel in a small restaurant with no English-speaking staff. Some people in the group are weak for spicy food. So, we always request for some recipes to make it not spicy/no chilis, and they always answer ok, but they serve still very spicy. For me, food is amazing. I like each recipe that we had. The taste and the smell I find delicious. The fruits, vegetables, and seafood are fresh and good quality. You can also find a lot of stores selling fresh, dried and preserved foodstuff like mangoes, tamarind, durian, macopa, coconut, fish, crab, squid, prawns, and many more at a very affordable price. 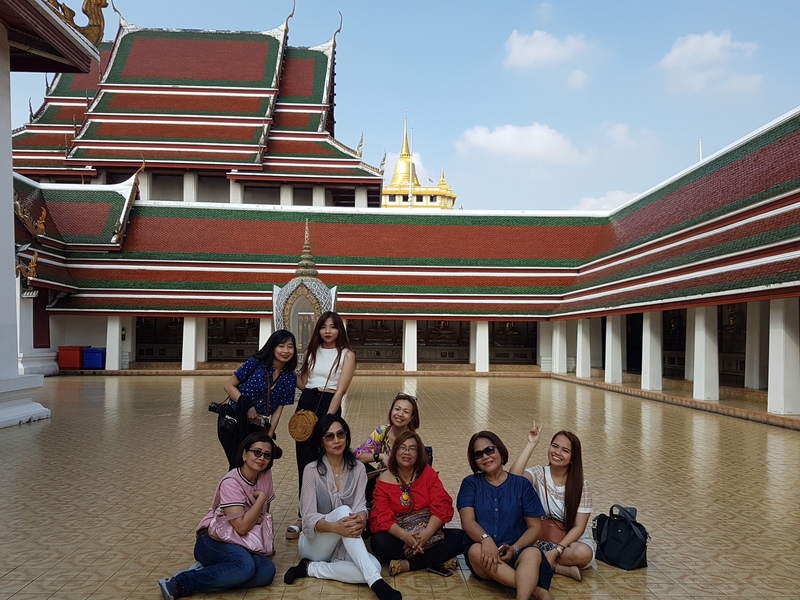 6: OUR DAYS IN BANGKOK – ACCOMMODATION, TOUR, SHOPPING, EATING, MEET NEW FRIENDS! In our bought package, our paid tour is a half day city tour and never mentioned in our itinerary what are the places we will visit. Comes morning, the tour guide has informed us that this paid tour is only to drive through the city and visit 2 temples. There was no any information and commentary given by the tour guide. She just basically just dropped us in front of the temple and did not accompany us to get inside. We envy that some other tour guides are with their guests and giving commentary. With respect like in any other churches and houses of religions, we must wear decent clothing. Here, if you are wearing clothes showing your shoulders, chest, and legs, they will not allow you to enter. You must be also discrete and careful in taking pictures or selfies. If you need to know and understand cultures, tradition, and life here, you must research and read because you cannot expect from your tour guide any commentaries. Most of them, their expertise is how to sell optional tour package and yet we are convinced. They will give you Free tour only to shopping centers as to where they will earn commissions out of your purchase. They minimized the time to spend with our paid tour, so they can allocate more time for us in their shopping stores. At the end of any offers or suggestions, you and your group will decide anyway. In Pratunam, people are at every turn and you will see the real life, unfiltered and up-close intense experience for jumble and wholesale shopping. I learned that most Traders are getting their supplies from here to bring to Europe and to other any countries to buy & sell the business. Siam and Chitlom are walking distance and the best way to get around the city is by taxi should you wish to go to some nearby areas. However, during rush hour, like in any other cities, traffic is congested and there is the alternative “Tuk Tuk” (Tricycle) that can weave in and out the roads. Some drivers are negotiable for fare and will ask you for a fixed rate, no matter how heavy the traffic is. If you are a pond of walking for at least 10 minutes straight, you can get at the train station to bring you to some other spots. We went to Nana Station as to where the nightclubs are famous. Being so curious about from what I have heard from male friends who had been here before, I challenged myself into this adventure ????. We watched some girls and ladyboys dancing naked on stage. We saw and compare different shapes of their bodies and trying to evaluate who had the best Doctor for transitions. Pity, picture taking is strictly not allowed here. I set my mind that I will act and think like a man, so I will not feel awkward. Plus, some bottles of beer to put more guts in my actions. Alas! We mixed ourselves on the dancing floor just like in an ordinary disco pub ???? Elephant ride (optional for additional 600 Baht) / Floating market – riding a Banca / Buffet Lunch / Magic show / Elephant show / Crocodile show. Of course, we enjoyed most the Elephant ride and show as this is the only one, we do not have in a country from among all those activities here. I was amazed how they trained the Elephant in simulations and acting, especially the football and raising on some parlor games and their reenactment for narrated history. But some people got dismayed that the Elephants were taught how to get tip mandatory. Right after the show, tourists will buy food to feed the Elephants and this is very nice. But then during picture-taking, the Elephant will take you close to him and you find it sweet. But be ready because it will not release you unless you give money. And if you do not understand that gesture of the elephant, the boss riding on it will shout at you and will say “give money”. Most in shopping stores except in department store, there is a strict no-fitting/no-trial policy. I honestly appreciate this policy for a hygienic reason. Imagine if you got one that has been worn by a person with body odor or skin disease? And here, they do not have much time for haggling. What is written in the display tag or card is fixed and no negotiation unless you will buy fully loaded boxes. You must also have the tolerance with your travel buddy who shops like in a labyrinth ? Number 1 rule is not to buy excess weight luggage at the airport. Do this online prior to your departure. The rate is much expensive when you buy on the spot. Make sure your luggage is properly packed and the zipper is intact. There is also specific size & weight allowed for your cabin hand-carry baggage. Check online depending on which airlines. Take note, the standard procedure upon entering the immigration counter and gate for departure. Remove your shoes, metallic belt, cellphones, laptop & watches and put in the tray together with your other bags for the x-ray. Passport, filled-up departure card, and boarding pass are 3 things you must carry along the way in boarding the plane. Arriving Manila is so relaxed and easy nowadays and there is a comfortable waiting area for someone who will take you to home. WHAT YOU SHOULD ASK BEFORE TO CONFIRM IN JOINING A GROUP AND SPECIFIC TOUR? Do not be blinded of those posted itineraries in the social media campaign. Some travel organizers use languages which you may have a different understanding. See below some words meant against its real definition. Inclusions = they mean what are those Included in the package price offer. Q: Is the transportation exclusive for our group for the entire stay and tours? (if joiners/sit-in coach) How many people are we in one group and in the bus/van? Tour Guide = it has a big difference from a tour coordinator. A tour Guide gives commentary in each place you will visit like its significance, history, importance, overview, etc. In the Philippines, only those licensed by the Department of Tourism who we called Tour Guide. Q: Do we have a Tour Guide or just Coordinator? Are they going to stay with us for the rest of the tour? ALL IN = it is not actually meant everything, especially the air tickets. This means only tour package + accommodation with or without full board meal. Q: What type of food? Is the lunch & dinner included? Is it a buffet? How much is this in a package? Do we have an option to buy from somewhere? Q: Can you specify the length (time) of stay in each place to visit? What are the activities set for each destination? How much are those in the optional? Pick-up and Drop-off time and place = most of them are not precise as they have set many pick-up points for joiners or sit-in coach. But normally for a group tour, it is always from and to your hotel. 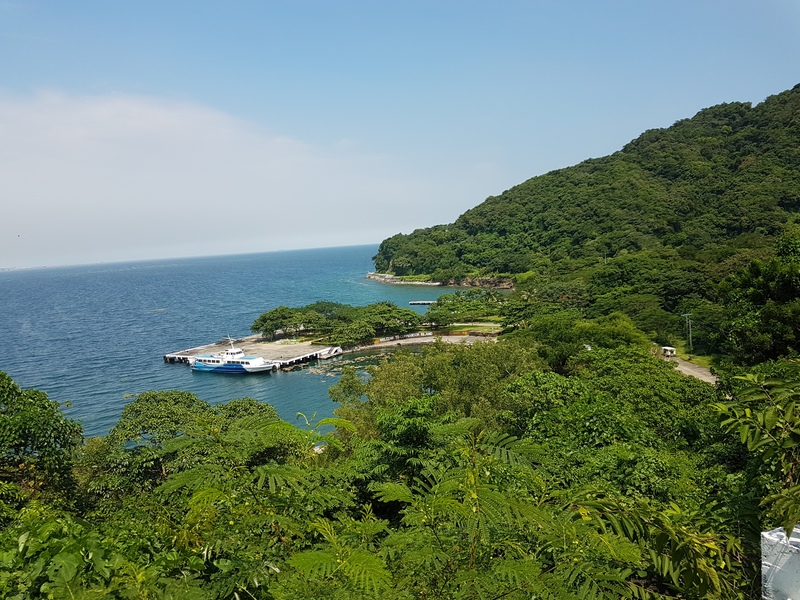 Best practice is that before you confirm your purchase, always check the tour itinerary and clarify the inclusions in the package and the optional tours being offered. In visiting other countries, consider first your main purpose of getting there, so it would be easy for you as to how long you will stay, which kind of tours you will take, what are the things you need to take with you, and how much pocket money and budget you need to set aside.